Math or Science homework giving you trouble?? Get FREE homework help from Rose Hulman students. 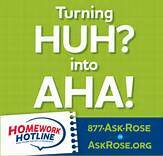 Call 1-877-ASK-ROSE or visit askrose.org for free tutoring help! INSPIRE is a FREE database that offers you tons of resources to help with your school work! (To see a FULL listing of their available resources, check the INSPIRE tab). Below are just a few resources to help you out! Designed just for kids! Working on homework & need a dictionary, encyclopedia, or pictures? Check here first! This is one database offered for FREE by INSPIRE. This is a kid-friendly search engine!!!! Another kid-friendly search engine, this site also has a dictionary, encyclopedia and images. There are also teacher resources.